The Mastiff, who is sometimes called "English Mastiff", is a heavy-boned, muscular and powerful dog breed. Combining endurance and strength, the Mastiff is one of the heaviest of all dog breeds, sometimes reaching over 200 pounds. Affectionate and intelligent, the Mastiff makes an excellent family pet. The Mastiff originated in Great Britain. Mastiffs range from 27.5 inches to 30 inches. Mastiffs range from 175 to 190 pounds. Mastiffs are typically apricot, fawn or brindle with black around the eyes extending to the muzzle, ears and nose. 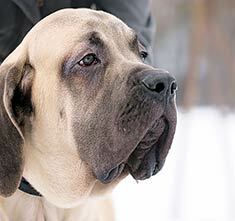 Mastiffs have a double coat with a short and straight outer coat and a short and dense undercoat. This dog breed is an average shedder and requires minimal brushing. The Mastiff is a territorial and courageous dog breed who makes a good watch-dog. Affectionate and gentle, the Mastiff gets along with the whole family. 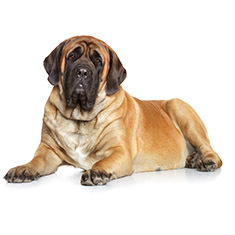 The Mastiff is susceptible to hip and elbow dysplasia, bloating, PRA, ectropion, CHD, gastric torsion, PPM and cardiomyopathy. The expected life span of the Mastiff is 8-10 years. Mastiffs will do best in a house with a fenced yard. 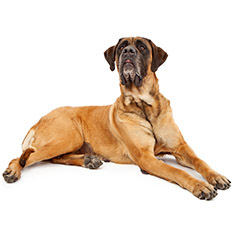 The owner of this dog breed should be a strong and confident leader in order to keep the Mastiff from becoming spoiled and pushy. The Mastiff is in the Working group. There’s no mistaking this extra-large dog from the working group. While the Great Dane may be taller, the robust Mastiff wins the size competition by virtue of his bulk. Mastiffs have been described as good-natured, courageous, dignified, and docile. There’s no mistaking this extra-large dog from the working group. What do Mastiffs look like? With his huge head, kindly black-masked facial expression, and gentle nature, this impressive dog is one of the largest recognized by the American Kennel Club. Male Mastiffs in the show ring must measure at least 30 inches at the shoulder, with females slightly shorter. They often weigh in excess of 200 pounds. In fact, the biggest dog ever documented was a 343-pound Mastiff named Zorba from England. The breed standard for Mastiffs specifies only three colors for the short, smooth coat: fawn, apricot, or brindle. The head is massive, the forehead wrinkled, and much of the face is covered in a black mask. The broad skull gives the head a square appearance. The body should be rectangular – longer than it is wide, and the chest is very wide, resulting in legs that are set far apart from each other. Where do Mastiffs come from? Because this breed is sometimes called the English Mastiff, you’d be correct in assuming they were originally bred in England. The current standard of the breed is thought to have originated in medieval times; however, some version of the breed existed as far back as 3000 BC. Drawings on many ancient monuments in Egypt show a dog similar to today’s Mastiff. In 55 BC, Julius Caesar wrote that his troops fought against a similar dog during the Roman invasion of Britain. Some of these dogs were taken back to Rome, where they were used as bull baiters, lion fighters, and even took part in fights with human gladiators. Meanwhile, back in merry old England, the Mastiff was used to protect hearth and home by keeping predators such as wolves at bay. How does a Mastiff act? Though they were bred to be fearless warriors and watch dogs, the present-day Mastiffs are known for their docile, gentle nature. Although they were originally bred to be fearless warriors and watch dogs, the present-day Mastiff is known for his docile, gentle nature. Perhaps as a leftover from their fighting days, Mastiffs are known to be intensely loyal and powerful. Mastiffs make wonderful guard dogs with no training required. Their innate desire to please their owners, coupled with their natural loyalty results in a dog who is more than up to the task of warding off intruders. However, unlike some other guard dogs who are valued for their aggressiveness, a Mastiff is more likely to simply knock down an intruder and sit on him than to attack. These dogs are generally clean, although they have been known to slobber quite a bit. They rarely bark, and will not bite unless incited to do so. They do like to dig holes, but become reasonably sedentary as they outgrow their puppy-hood. Intense exercise is not recommended for any of the giant dogs before the age of two years, as their joints are still developing and may easily become inflamed. Like most breeds, the Mastiff prefers indoor living, where he or she can be with family, to outdoor kenneling or living in a dog house. Some breeders will not even sell you a Mastiff puppy unless you promise to keep the dog in the house. It is believed that their emotional development can be stunted if they are not provided a way to stay as close as possible to their human families. A Mastiff by any other name…still a Mastiff? The Mastiff, as recognized by the American Kennel Club, is also sometimes called an English Mastiff. The two terms are interchangeable. However, the other Mastiff breeds are distinct and separate. The Bull Mastiff is a cross between an English Mastiff and a Bulldog. The Bull Mastiff is smaller than the English variety. The Neapolitan Mastiff is shorter than the Bull and English types, and carries a body full of wrinkles, from head to tail. The French Mastiff, also known as the Dogue de Bordeaux, is shorter than the others, and is often red in color. The Tibetan Mastiff has a longer coat and comes in a variety of colors, in contrast to the short, smooth coats of all of the other types. People who don’t pay close attention may call any of these breeds a “Massive”. It is fitting because of their large size, but not correct. Mastiffs have an intense desire to please and are easily trained using positive training methods. Because of their immense size and strength, early training and socialization are absolute requirements to having this breed in your home. It’s much easier to teach a puppy not to jump up than it is to work with a 200-pound locomotive who has never been taught his manners. Grooming requirements are slight for this breed. A good brushing once a week or so should be sufficient to keep the dog clean. Grooming requirements are slight for this breed. A good brushing once a week or so should be sufficient to keep the dog clean, and a semi-annual bath will finish up the job. Mastiffs shed, particularly twice a year as the seasons change, but the fur is short and relatively easy to sweep up. Regular brushing will help keep most of the fur off of your carpets and furniture. It is best to feed the Mastiff two or three times each day. Feeding a dog this large just one large meal can result in bloat, a veterinary emergency where the stomach twists on itself. Smaller meals are thought to lessen the occurrence of this sometimes fatal condition. Is the Mastiff the right breed for me? If you have a home and yard large enough for a Mastiff to get some exercise, you have met the first qualification for having an extra-large breed. Beyond that, you should be prepared to put up with moderate shedding, lots of drooling, and some back yard hole digging. Barking is minimal, and this companion dog is good with children and other animals. 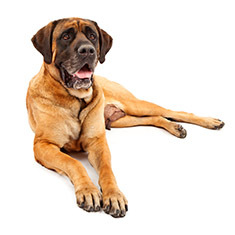 You can expect your Mastiff to live about seven years, although many of them live to the ripe old age of 10 or even older. Find Mastiff Puppies with our Free Breeder search!